In 1887 Congress passed the General Allotment Act also known as the ‘Dawes Act’. “Friends” of American Indians believed that this act and other assimilationist practices were an alternative to the extinction of Indian people. The Cherokee and the other Five Civilized Tribes which included the Creek, Choctaw, Chickasaw, Cherokee, and Seminole resisted the act. The act stated that the head of each family would receive 160 acres of tribal land and each single person would receive 80 acres. Title to the land would be held in trust by the government for 25 years. After 25 years each individual would receive United States citizenship and fee simple title to their land. Tribal lands not allotted to Native Americans on the reservation were to be sold to the United States and the land would be opened for homesteading. Proceeds from the land sales were to be placed in trust and used by the government as an account for supplies provided to Indian people. The Cherokees western land extension was sold to the United States in 1891 and in 1893 opened, mostly to non-Indian settlers, in a famous land run. 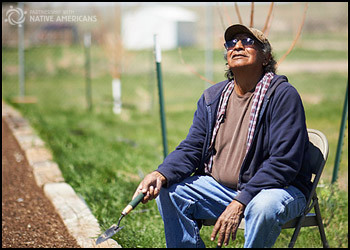 When the allotment process began in 1887, the total land held by American Indian tribes on reservations equaled 138,000,000 acres. By the end of the allotment period landholdings had been reduced to 48,000,000 acres. Since 1934 the landholdings have slowly increased to 56,000,000 acres.